Hippocrates, the father of medicine, once taught that the diseases caused by overeating can be cured with fasting. The earliest treatment for diabetes at the turn of the 20th century, for example, quite literally starved patients for a few days. Today, people fast for spiritual and political reasons, as well as for dieting and health effects. The weight loss experienced through fasting is generally small, is mostly water weight and is quickly reversed when you return to regular foods. However, the choice of what to eat and drink is largely up to you, as well as the rules of any religious exercise you may be following. In many fasts observed for spiritual discipline, you abstain from all foods and drink only liquids. In most cases, that means drinking only water. However, you may also have a choice of drinking tea or water with lemon. During Ramadan, many Muslims fast from all food and water. Water is advisable during most fasting for dietary purposes. Under most conditions, you can't survive longer than a week without it. 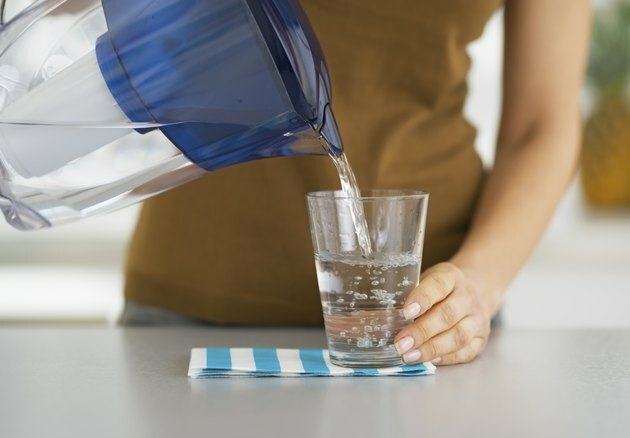 Severe dehydration can pose a life-threatening emergency. The Daniel Fast, observed by many Christians in January or February, is a partial fast. It is based on the story of a young Hebrew man in the Bible who was forced into the service of an Egyptian ruler but refused to eat his food. This fast is based on restrictions rather than total abstention. You eat foods, like whole grains, beans, peas, lentils, fruits and vegetables, seeds and sprouts, along with water and honey. Several variations of the food lists exist. The overarching principle, however, is to consume whole, natural foods and avoid meat, refined and processed foods, fried foods, heavily preserved foods, butter, margarines and most dairy. In research, fasting has been controversial as a weight loss tool. However, total fasting, partial fasting and supplemental fasting has been used in research for many purposes, and researchers have observed many significant reductions in body weight. For example, supplemented fasting was once widely used as part of treatment for morbid obesity. A study in the "Journal of the National Medical Association" involved 46 obese patients who took one liquid preparation each day containing a mix of protein, carbohydrates and essential fatty acids. It supplied 420 calories daily. After six weeks of intensive medical evaluation, participants lost an average of 56 lbs. A University of Illinois nutrition professor advises alternate-day fasting in which you eat only a large lunch and nothing else the entire day and then the next day you eat whatever you want. The method was tested in a 10-week study in which participants lost between 10 and 30 lbs. This finding was similar to one produced by researchers from the Pennington Biomedical Research Center. They found in a nonobese sample, participants lost weight, but their hunger sensations increased. For their fasting days, they could consume water, energy-free beverages, tea, coffee and sugar-free gum. On alternate days they could eat at will. Most lost about 2.5 percent of their body weight in 22 days. The researchers thought participants might have fared better hungerwise if they had one small meal on their fasting days. Talk with your health care provider before beginning a fast for dieting reasons. Better options may exist for you. Generally know that like all dieting options, you have a great deal of choice when it comes to fasting diets. Discretion is warranted, however, as obviously eating high-calorie foods will sabotage your efforts. You might also try a tapered approach to fasting, as this type of diet requires discipline. You are more likely to yo-yo when you try to strictly fast for a sustained period of time. A naturopathic practitioner advises on Healthy.net that you should have a small meal on the first few days of your fast. In addition, know that if you are pregnant or nursing, a child, or if you have an eating disorder or impaired immune system, fasting can cause serious health consequences.